Date: May 10–August 19, 2012. Video props throughout the exhibit projected private conversations between actress Judy Davis (playing the role of Elsa Schiaparelli) and Miuccia Prada (as herself). They discussed past experiences that led them into fashion and their role as designers. In Elsa Schiaparelli’s time, Café Society was prominent; social settings congregated around the seats of restaurants, which created a demand for fashion from the waist-up, so Schiaparelli focused her creativity on embroidered jackets. 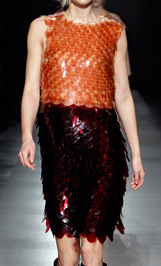 The Waist-Down approach was developed entirely around Prada’s preference. More comfortable with the idea of fashion from the waist down, she immersed herself into the craft of embroidered skirts. 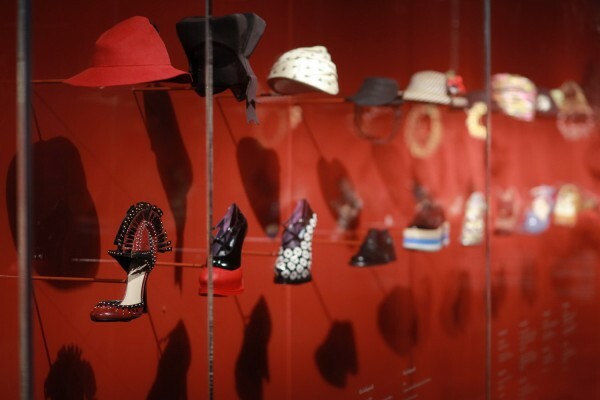 Continuing with the theme of Waist Up/Waist Down, Schiaparelli created some of the most compelling hats and jewelry, one hat in particular was her famous shoe-hat, while Prada rendered much success for her amazing shoe creations, most notably a Cadillac shoe. Within the sphere of creative process, Prada and Schiaparelli challenged the idea of playfulness in children’s clothes and devised a way to add a mature spin for adult women. 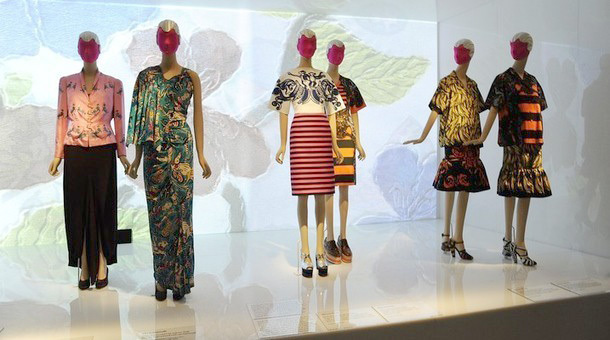 Schiaparelli incorporated butterflies and horse prints, while Prada used gardens, fairies and banana prints. Both designers shared images of a circus carnival theme. 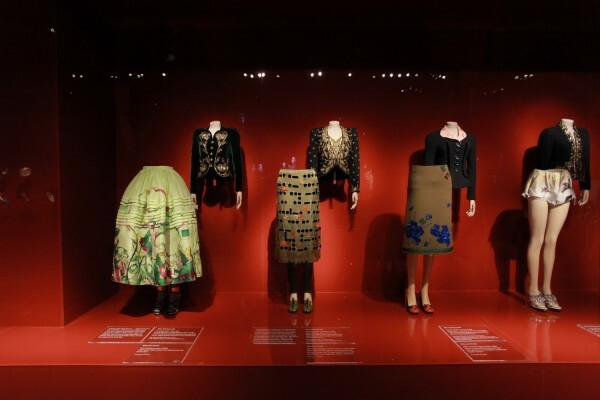 Both designers redefined our perception of aesthetics, modernizing unappealing patterns, colors and fabrics, combining contradictions and altering them to the point of complete satisfaction, as Schiaparelli did with sweaters with patterns, and Prada with tweed and 70’s themed prints. Both designers exhibit undisputed culture. 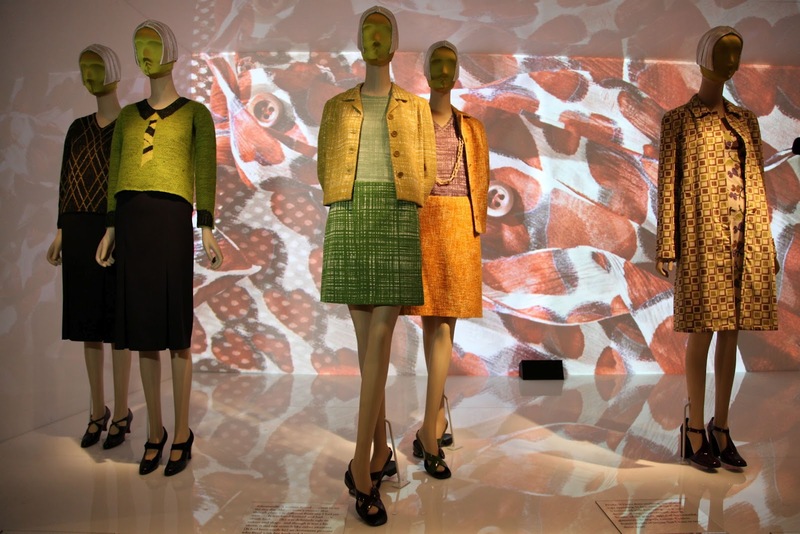 Schiaparelli was very direct in her approach to regional style, while Prada enjoyed playing with subtle elements. In a video dialog between Schiaparelli and Prada, Schiaparelli tells Prada how she used bark, cellophane, glass and traveled around the world to generate her ideas, but Prada informs her how times have changed and everything has already been done, so she just modernizes exotic beauty. 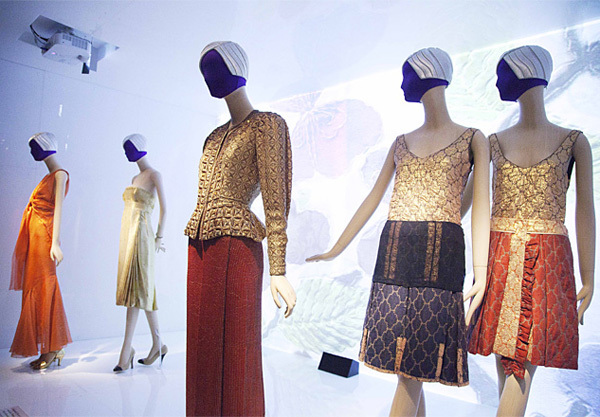 Prada and Schiaparelli shared a common love for the ancient past. 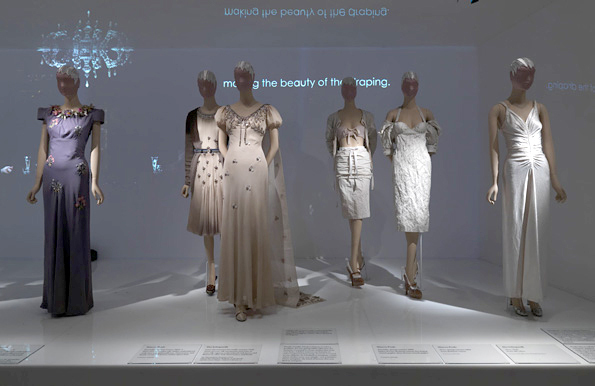 Of course, Schiaparelli took a more literal stance on her design options, paying homage to the Greek goddess in a classical white dress and using empire lines in her evening-wear, while Prada worked to modernize and even sexify the use of antiquity, for her it was merely a basis for inspiration. In Schiaparelli’s era, the mere act of collaborating with artists to create fashionable garments was not only ingeniously innovative, but in itself an art-form. Schiaparelli incorporated materials such as monkey fur and a lobster printed skirt. Living in a contemporary world, Prada worked independently from artists; she instead chose to extract art from an observational stand-point and deposit them into her collection. 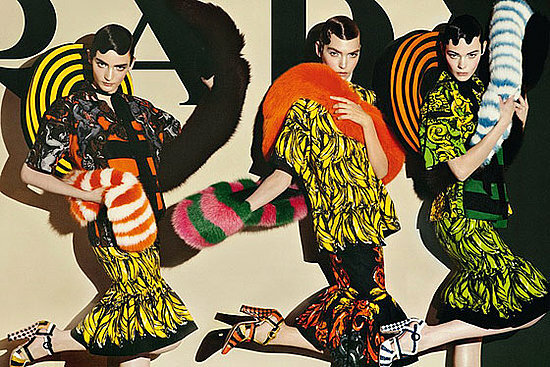 Prada made use of elements in nature, the mixing of fur, plastic fringe and feathers, and a scale dress for Fall 2011. 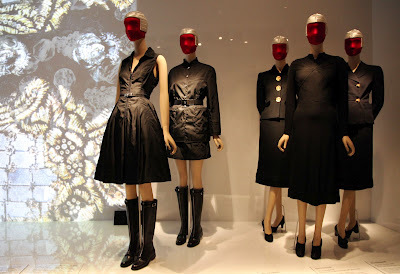 In my observation of these two designers, Schiaparelli exemplifies Old Hollywood, while Prada personifies modern elegance. In conclusion, both women overcame the obstacles of their time. For Schiaparelli, it was her impulsiveness and infinite imagination that transposed her from a troubled child, to a renowned designer. 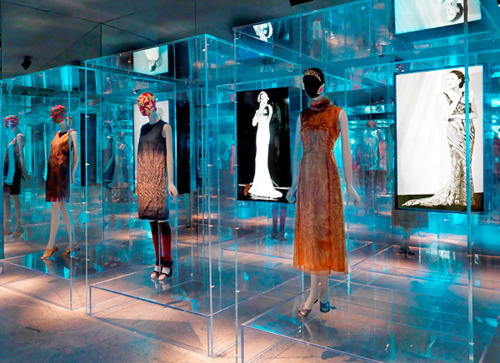 Prada faced her own personal demons, hiding in the theater as a mime and facing attacks for overtaking the family business of luxury goods until she made it to the frontier of fashion.